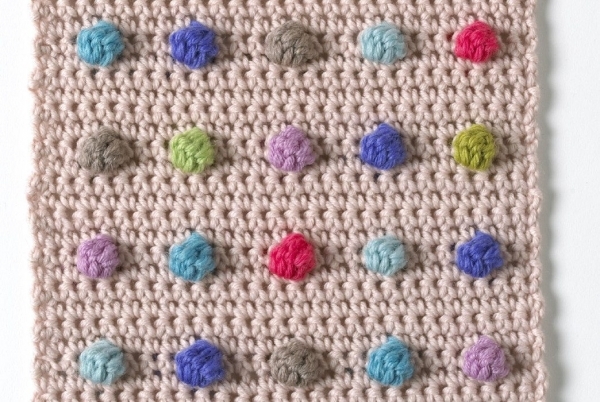 The crochet bobble stitch is a great stitch that brings a lot of texture to your work. 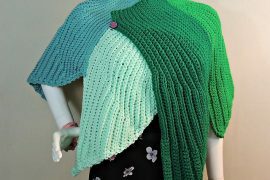 It is similar to the crochet popcorn and cluster stitches but seems to be the more common of the three in recently released crochet patterns. 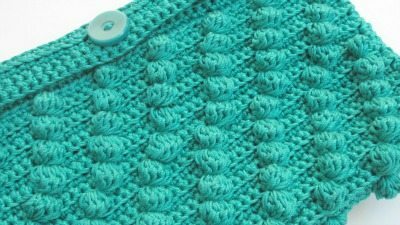 If you’re seeking to add interesting elements to your work, check out these thirteen crochet bobble stitch patterns. First you can get started by learning How to Crochet a Basic Five Stitch Bobble via @hobbycraft. There are other options for working a crochet bobble and you might explore some of those in the patterns below but this basic tutorial will teach you the main things that you need to know. Bobble stitch heart crochet potholder free pattern from Sew Simmer and Share. The bobbles here are placed intriguingly, not only in the shape of the center heart but also in singles, clusters of four and around the edging of the piece. Working this simple crochet potholder pattern can therefore give you a really good sense of what the bobble can be used for! 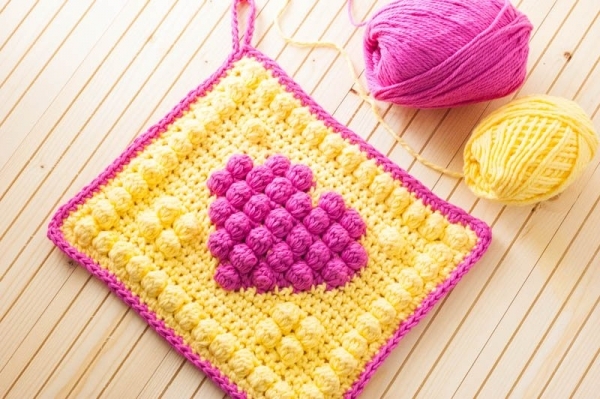 See more crochet potholder patterns here. Bobble stitch crochet cowl free pattern from Undeniable Glitter. 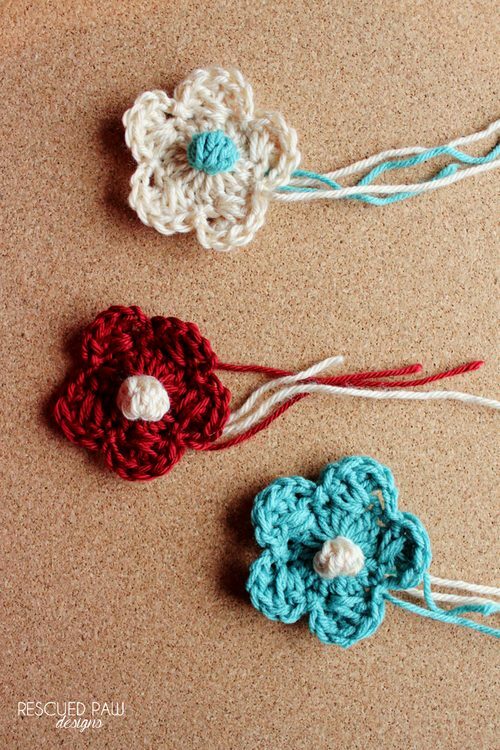 This is a more straightforward use of a repeating crochet bobble stitch. 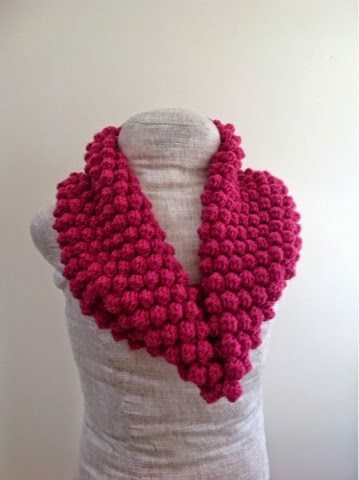 It creates a dense, textured crochet cowl that is going to be really cozy for the colder months of the year! See more crochet cowl patterns here. 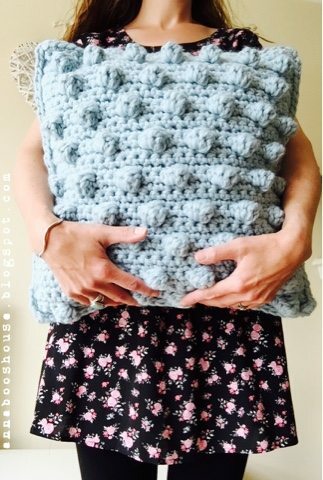 Bobble stitch cushion free crochet pattern from @annabooshouse I love the chunky effect of this crochet bobble cushion and the fact that you can see the other stitches in between the big bobbles. This would definitely add big impact to a couch, chair or bed in your home. A set of them would be irresistibly cozy. 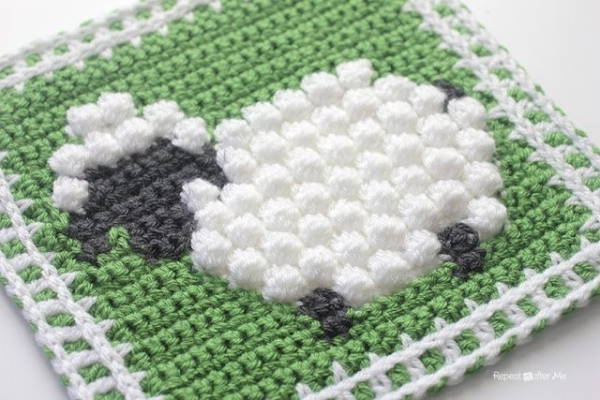 Bobble stitch crochet sheep square free pattern @repeatcrafterme. The bobbles are used here to really make you feel like you’re experiencing the cushy touch of the sheep’s wool! The rest of the square is worked in flat stitches so that wool really pops out. Great effect. This would be a terrific addition to my previous list of crochet sheep patterns for this year, the year of the sheep. V-stitch and bobbles crochet scarf and fingerless gloves pattern free from Handmade by Camelia, which you might have seen in my previous roundup of 20+ matching crochet pattern sets. This not only has the beautiful texture of the rows of bobbles but also the beautiful intricate details of the lovely v-stitch. 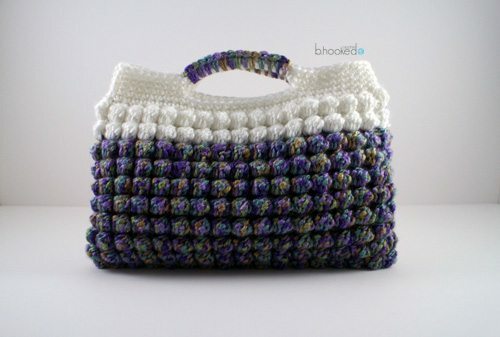 Bobble Stitch clutch crochet purse free pattern @bhookedcrochet. This pattern is really all about the bobble, worked in solid rows all the way across, with the cutest little handle as an added detail. You may have seen this purse in my previous roundup of 25+ free crochet accessories patterns because it’s one of my favorites from this year. Bobble crochet flower free pattern from Rescued Paw Designs. This simple crochet pattern really emphasizes how even one simple crochet bobble can take a basic design like an appliqué and elevate it to a new level. 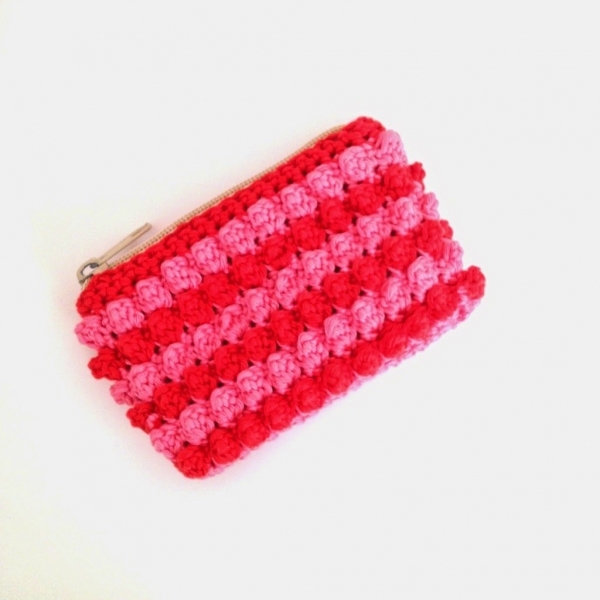 Diagonal bobbles clutch free crochet pattern from Marie of Underground Crafter. As you might have noticed, bobbles can be worked in rows across or staggered in such a way as to create interesting patterns, including the diagonal pattern you see here. The single solid color of this crochet purse is made much more interesting by the textured layout of the bobbles. We see the opposite choice – the horizontal layout of the bobbles in this – bobble stitch wallet free crochet pattern from @annemariesblog. The alternating colors create graphic textured stripes that make a big impact on the eye even with just this little accessory. I named this beautiful free bobble crochet scarf pattern from Pigtails one of the best 2014 crochet scarf patterns because I love how it is so simple to work up and doesn’t require any color changes but it is still super interesting for the eye and makes a great fashionable accessory that can be used year-round (at least here in northern California it can anyway). 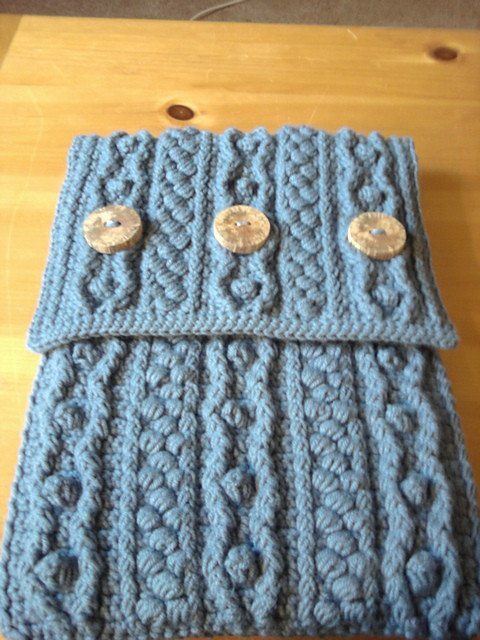 The Bobble Wrap Laptop Sleeve, a free Ravelry crochet pattern by Emily Wendel, takes the bobble to a new level by adding some faux cabling elements. It really takes the bobble and shows what it can do by using other textured lines and curves to highlight its impact. Plus it’s great because it’s dense and that’s definitely the kind of cushy protection that you want in a crochet laptop cozy! 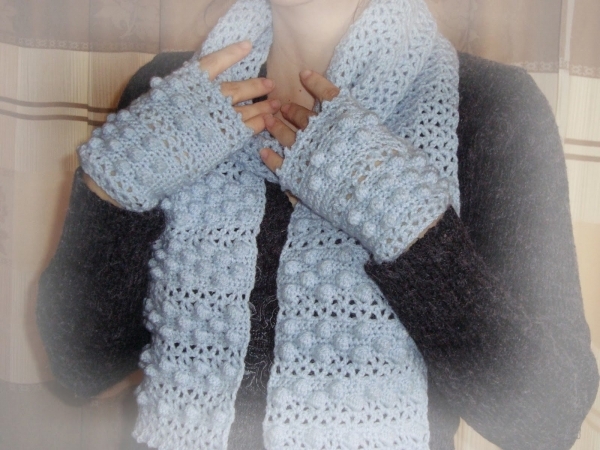 This is the Bobble Diamonds and Posts crochet scarf pattern for sale on Ravelry by Marie Segares. It combines bobble stitches with post stitches for really great texture that’s different from what we’ve seen so far in the other designs. The layout of the bobbles is unique and interesting. By the time you work through all of these crochet patterns, you should have a great idea of what you love to do with bobbles!